Enda Kenny has been re-elected as taoiseach (Irish prime minister) 70 days after a general election which had produced no outright winner. He held the role of acting taoiseach over the past 10 weeks as talks took place between parties and independents on how to form a new government. His Fine Gael party won the most seats in the election but fell short of the quota needed to rule without support. It is now expected that Mr Kenny will lead a minority Fine Gael government. His re-election followed a deal with a number of independent elected members and the Republic of Ireland's second largest party, Fianna Fáil. Fianna Fáil has agreed to support Fine Gael's programme for government over "three budget cycles" while some independents are expected to become government ministers. Accepting his nomination, Mr Kenny told the Dáil (Irish parliament) that its members must now "work together in the best interest of all our people". Fianna Fáil leader Micheál Martin said the deal represented "a major turning-point for Irish democracy". "It marks a decisive shift away from a government with the absolute power to control our parliament." Mr Kenny has made history by becoming the first Fine Gael taoiseach to be re-elected to the office. He was re-appointed with 59 votes in favour and 49 votes against. However, it was the fourth attempt to appoint a new prime minister since the general election of Friday 26 February returned a hung Dáil, in which no party won enough seats to govern independently. The drawn-out talks process attracted much criticism from many commentators who urged the leaders of the largest parties to come to an agreement in order to avoid another election. 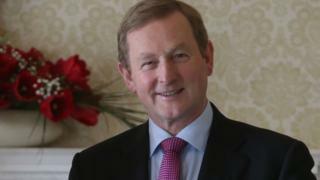 Before he called February's election, Mr Kenny had led a coalition government for the past five years, with the Labour Party as Fine Gael's junior partner. That coalition came to power shortly after the Republic of Ireland was forced to seek an international bail-out from the European Union and International Monetary Fund (IMF). Despite driving an economic recovery, the Fine Gael/Labour coalition were punished at the polls by an electorate weary of five years of tough austerity policies. In his acceptance speech on Fridau, Mr Kenny said that while the coalition brought the state back from the edge of an economic cliff, he recognised that not everyone experienced the recovery.